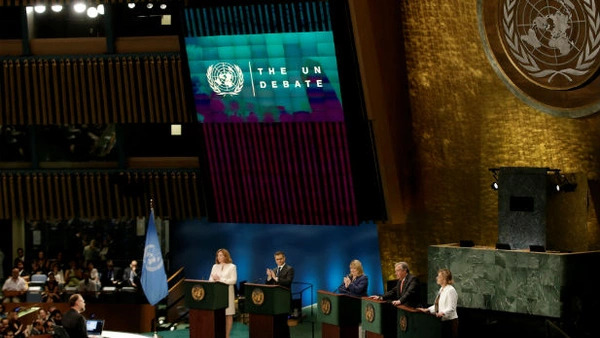 Candidates vying to become the next United Nations secretary-general debate in the UN General Assembly in New York on July 12, 2016. From left to right are Natalia Gherman, Vuk Jeremic, Susana Malcorra, António Guterres, and Vesna Pusic. The following is a guest post by Megan Roberts, associate director of the International Institutions and Global Governance program at the Council on Foreign Relations. This week the UN Security Council will conduct a second straw poll in the race to select the ninth secretary-general (SG) of the United Nations. António Guterres, who recently stepped down from a ten-year run as UN high commissioner for refugees, emerged as the surprise early frontrunner after the first poll. However, the Council’s final choice likely won’t be known until the fall, and those watching the race should expect many twists in between. More important than who is selected is whether the process paves the way for real reform in how the UN chooses its senior leaders. This year’s race has already broken new ground. For the first time candidates to lead the United Nations have been required to be formally nominated, to provide vision statements, to conduct public interviews, and to participate in a town hall debate. These new requirements have introduced unprecedented transparency in the selection process, as well as attracting perhaps the most qualified slate of candidates for the position yet, including a former president, several former prime ministers, and officials with deep UN experience. With the start of Security Council straw polls, however, the process has taken a more traditional, closed turn, and observers have once more turned to watching the Council’s smoke signals. (The results of the first straw poll were not officially disclosed, but were quickly leaked.) Still, the unprecedented media scrutiny and the expressed desire of many member states for a strong SG may make it harder for the Security Council to choose a weak reed of a candidate that bends to their needs. It is possible, as Richard Gowan notes, that a more protracted battle among the Council’s five permanent members (or P5) may favor “lowest-common denominator figures.” But interest in a stronger SG comes at a time when the UN is facing multiple crises. The war in Syria, which has unleashed a humanitarian and refugee crisis, is obviously at the top of the list. But spikes of violence and political turmoil in Burundi, South Sudan, and elsewhere also demand the UN’s attention. The past year also witnessed the historic adoption on the Sustainable Development Goals and the Paris agreement on climate change, which urgently need to be implemented. At the same time, the UN is mired in controversy, not least for its belated response to shocking sexual abuse perpetrated by its peacekeepers. The next SG will need to deliver on the UN’s ever more ambitious mandate while ensuring that the institution upholds its values. To have any prospect of success, Ban’s successor will need to rely upon the UN’s 44,000 international civil servants both in Turtle Bay and around the world both to implement policies and programs and to raise the alarm in the event of crises. The problem? The personnel systems in place for recruiting and deploying these experts are badly broken. Greater transparency may be finally arriving to the SG selection process, but the same principle has not been extended to other senior appointments within the UN, where patronage politics still prevail. Member states lobby on behalf of their nationals for senior leadership positions, often bypassing competitive recruitment processes. The system favors powerful states, especially the P5, who must approve both the SG’s initial selection and the renewal of his or her term. Member states covet these appointments as part of what Foreign Policy’s Colum Lynch calls “the transactional nature of international diplomacy at the UN, where plum assignments are used to lubricate the wheels of statecraft.” Although SGs often seek to push back against member state efforts to determine senior-level UN appointments, the UN’s own investigators have found that no SG has been “immune” to this pressure. Indeed, high-level appointments within the UN secretariat are increasingly “sticky,” meaning that positions are successively held by nationals of the same country, despite multiple General Assembly resolutions against the practice. For instance, the top UN peacekeeping post has been filled by France since 1997, when Paris was reportedly offered the position in exchange for withdrawing its veto over Kofi Annan’s appointment. Similarly, for nearly ten years the United States has claimed the top spot in the Department of Political Affairs, just as the United Kingdom has held the UN’s top humanitarian post, and China the top spot in the Department of Economic and Social Affairs. Russia held the senior position in the UN’s Geneva office for seventeen years before assuming leadership of the Vienna office in 2010. The P5’s hold over these top positions only encourages other influential countries to lobby to fill positions down the chain of command with their own nationals. As for the mass of UN members, their desire to open up the choice of important senior positions was on full display during the SG candidate interviews. Gender, as well as nationality, remains a pivotal consideration. Overwhelmingly, the top spots are given to male candidates, particularly those positions that are controlled by the P5. In 2015, more than 80 percent of all senior UN appointments were male, erasing gains toward gender parity made earlier in Ban Ki-moon’s tenure (though statistics from the first half of 2016 show some improvement in this regard). In a year when so much attention has been paid to selecting a female SG, this imbalance in other senior positions is striking. The end result is an in-built tendency to select men from powerful countries to staff senior positions at the United Nations. The current system, beyond disadvantaging more than half the population, harms the UN’s credibility—a complaint raised by UN staff members in a recent open letter. For experienced UN-watchers, this is hardly news. But it matters more this year as candidates for the UN’s top spot engage in longer and more open campaigns, increasing the likelihood that member states will demand exclusive rights to certain senior positions in exchange for political support. The risk will be even greater if P5 members disagree on who should be selected—a distinct possibility, based on the results of the first straw poll this year. To make matters worse, the rest of UN staffing is also in disarray, afflicted by recruiting delays and an uncompromising bureaucracy. In a scathing critique penned on his departure in February, senior UN official Anthony Banbury excoriated the UN’s “sclerotic personnel system,” which often requires breaking rules just to get urgently needed staff to crisis situations. Banbury is not alone. The 2015 High Level Panel on Peace Operations found that there is “no topic that elicits greater frustration in the field across all levels of staff.” Peace operations demand the ability to move staff flexibly and bring on board specialists quickly. Instead, processes for recruiting essential staff have become even more rigid and inflexible. It now takes on average over two hundred days to fill a position—and changes introduced this year are expected to drive that figure still higher. Although staffing issues may seem a dry, administrative issue, the next SG would be wise to exploit his or her early window of opportunity to push for a timely, competitive, and merit-based recruitment model. This campaign may touch a nerve with member states that mistrust a stronger secretariat. But if the UN has any intention of delivering on the ambitious pledges it has made over the past year, member states will need to take an honest look at how the institution can bring in the right people to get the job done. By shedding new light on the SG selection process, member states have generated the strongest and most qualified group of candidates ever to aspire to lead the United Nations. It is time to bring similar transparency to the selection of those whom he or she will lead.